The components of the Windows Application Event Log are standards defined by Windows. The following figure illustrates the Windows Application Event Log components when shown through the Event Viewer. The following table describes how Progress uses the Windows Application Event Log components. Identifies the type of message such as Information, Warning, or Error. Identifies the date the event occurred. Identifies the time the event occurred. Source of the event. This is the name of the connected Progress database, if a database is connected. If no database is connected, then "Progress" is listed. If you are using the Progress AppServer, "Progress" is also the default source for Progress AppServer messages. However, you can override the default source name by specifying the -logname AppServer broker startup parameter. Associates to the Progress message that was generated. These are the same message numbers that are displayed in the standard database .lg file. 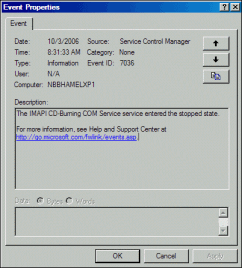 Identifies the user logged in to the Windows workstation where the event occurred. Identifies the name of the Windows workstation where the event occurred. The Event Viewer allows you to get more information about events by double-clicking on any event. You can view additional information about an event by double-clicking on it. Windows displays the Event Properties dialog box, as shown in the following figure. The Event tab displays details about the event you initially select. You can also use the arrow controls on the Event tab to scroll through detailed information about the other events that appear on the Windows Application Event Log components viewer as shown in the figure .